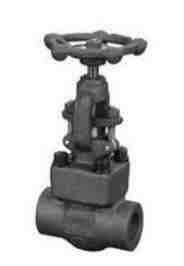 Our Forged Steel Globe Valve is demanded owing to its high strength and durability. Our Forged Steel Globe Valve has taper plug type disc and renewable seat rings with perfect matching type of mating parts to assure leak tightness (horizontal type). We can also provide Regulating Plug or Needle Type Plug on special request. We are dedicatedly engaged in manufacturing, exporting and supplying premium grade Forged Steel Globe Valve.